Timber Stand-Excellent stand of pine and some hardwood. 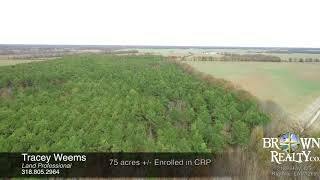 Improvements-75.50 acres of CRP pines that were planted in 1988 and have been fertilized with 250 DAP in 1996 and 200# of UREA in 2000; Timber is ready for a thinning that will produce income. Comments-This is an excellent tract for recreational investment with the large amount of timber on the tract.